Facebook Ads: Can You Buy “Likes”? I‘ve been flirting with the idea of buying Facebook PPC ads for a while now. I have two main presences on Facebook: my own personal profile, which now stands at 876 friends (partly because I’ve been active on Facebook since early 2007), and my business page, The Art of the Business, which, until two weeks ago, had about 230 “fans” or “likes.” I have had this page only a bit more than a year or so, and there were chunks of time when I essentially abandoned it, but I’m serious about trying to build up my numbers and my interactions on this page. The idea of separating business from personal is a good one, I think. I post a lot of personal stuff on my personal page: mostly stuff that has to do with my son. And I want my business page to be about business, not my son, so that is partly why I made that move. There are certainly other really good reasons to get a Facebook page for your business. I made a few forays over the last few months to drive up my FB page’s numbers. For example, I asked my own personal friends to “like” the page, and they did–at present nearly half of the people that follow my Art of the Biz page are also my friends (105, to be exact). So, it’s important to me that I post different things on my personal page than from what I post on my biz page. If something is really, really important to me, and relevant to both, I will re-post it to both, but I try not to do that too often. So… I’ve tapped out the “friends” market, and I want to get new “likes.” What to do? Well, I have “like” buttons on my website and on my blog and on my e-newsletter. That might drive a few in. But I decided I’d try buying a Facebook ad for a couple of weeks and to see what the result would be. Like Google ads, FB ads are Pay-Per-Click, which means that if you see my ad over on the right-hand side, I’m not charged for it. But if you click on the ad, I am. I tailored it to Artists in the United States, Canada and the UK, adults, and I also included keywords like Marketing and Social Media. I set my budget at $7 a day, and the ad ran for two weeks, my final bill coming in at just under $100. During this time, my FB page grew by 43 “likes” to 273. You can see from the report that only roughly half of the people that saw and clicked my ad (and were then taken to my FB page) actually liked the page (or, according to FB, 0.013% of all the people that saw my ad actually liked the page). Still, my ad was seen (ie: 1 touchpoint) almost 170,000 times. So…. successful? Or not? Well, certainly I could have played around some more with the wording of the ad, or I could have increased my budget or attempted to decrease the cost-per-click. Really, for me, it was an experiment. And it cost me $100. But if you average it out, that is more than $2 for each new “fan.” And, considering that I am not directly selling anything off of my Facebook page, I think that ROI is not great. Have you tried Facebook ads? What’s been your experience? thanks for this article, very helpful. The tempting little invitations on the side of my page draw me in from time to time. My experience with facebook ads is that they don’t sell paintings which is the business I’m in. I always bring my decisions down to that one thing…., “is this selling my work”. Being on an artists budget I have to be careful where I concentrate my spending. The question now is, where do I put my ad dollars? Still haven’t found the magic bullet. 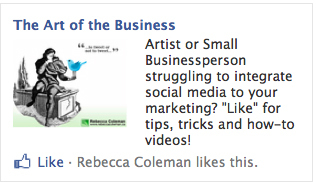 I, like you, Rebecca, did the same thing as an experiment with my facebook page. I spent $200 though over a two week period and got 200 likes in that time (above and beyond the ones I already had from friends and such). Was it worth it? As an experiment, YES. For business, NO. Having said that, I think it could be very helpful for some businesses. For example, an arts presenter in a smaller community. You could easily target in your small community only and not spend much but perhaps pick up some meaningful interest in you page. I don’t regret spending the money and I did probably pick up some genuinely interested people that have become fans of my site, but I’m not inclined to continue. Thanks for all your feedback, folks. I think I didn’t mention that the URL for the ad lead to a Facebook landing page with includes a video of me introducing myself and talking about the value of people “Liking” my page. I am now a theatre marketer, but I used to work in an online marketing agency and we ran a lot of facebook campaigns. One thing I wonder about getting “likes” is, what’s the actual value of a like on your page? I find it very difficult to communicate with people directly through FB. I would rather have their email address on my newsletter than a like. So, you can try having your FB ad go to a landing page on your site with a conversion goal other than “likes” – like newsletter sign ups, or even RSS subscriptions, etc. And if you go to your page to get their email, you can easily offer a pdf in return for the info (or whatever) — you can on FB too, of course. I think you can also buy FB ads and pay per “like”. Since I’d rather have an email than a like, I’ve never done it, but if likes are the metric you’re measuring, may be somethign to consider. Thanks for your comment, Kathryn. but, yeah, it’s certainly tough to put a price on a ‘like’. Mining people’s facebook pages for their email addresses makes me uncomfortable, but I agree that email addresses, in this situation, may actually be worth more, in terms of ROI, than Facebook ‘likes’. This blog post was actually about an experiment I conducted where I purchased PPC Facebook ads that lead people back to my FB landing page, where I asked them to ‘like’ the page. The conclusion: you can buy ‘likes’, but the ROI is not good.